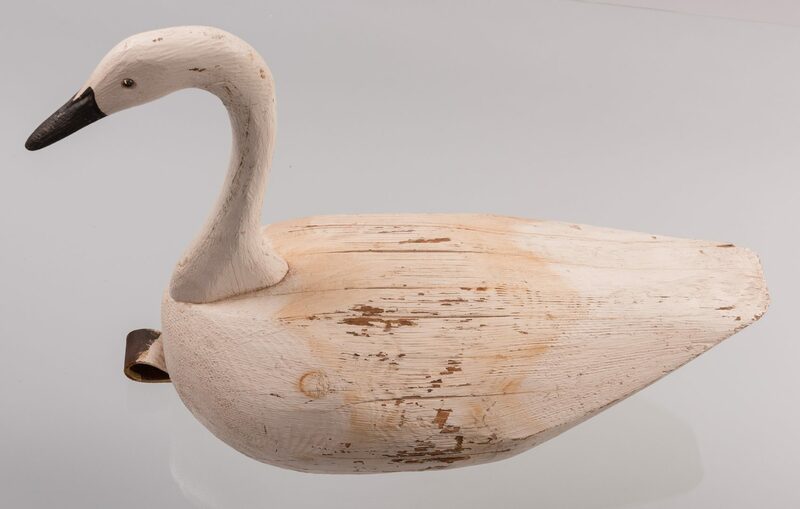 1st item: Carved and painted wood Swan decoy with glass eyes, stamped F & S to underside. Leather strap attached to front edge of body with metal plate to the underside. Body 24" L x 19" H. 20th century. 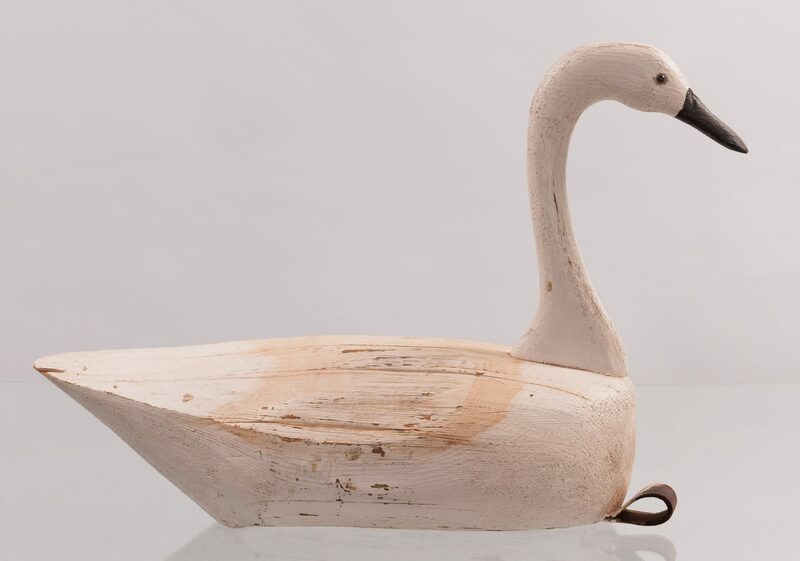 2nd item: Carved and painted wood Mallard decoy with movable head and glass eyes, partially legible stamp reading to base reading "Charles….solo…Fulton…NE" . 6 1/2" H x 16" L. 20th century. 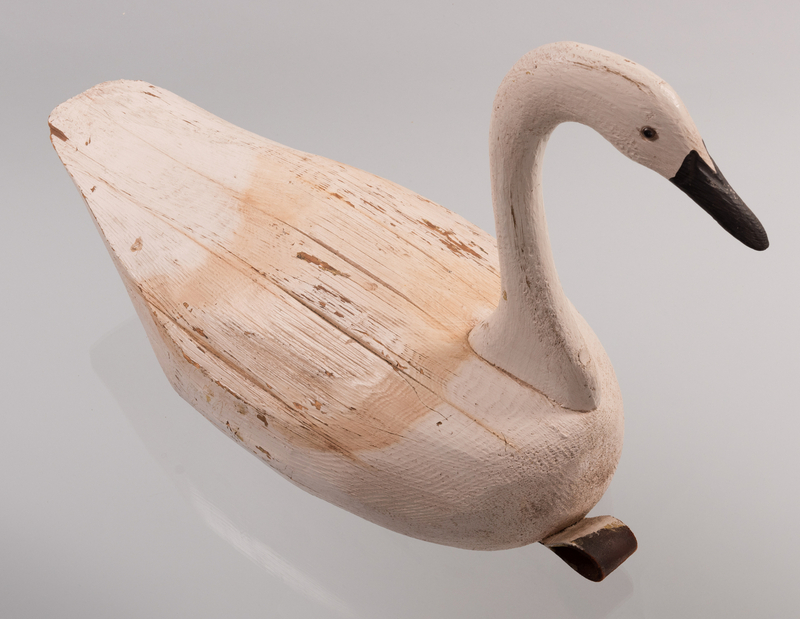 3rd item: Captain Harry Jobes weighted carved and painted wood Canvasback decoy, signed in pencil on the base úCpt Harvey Jobe, Cheseapeak (sic) Bay MDî together with a "W". 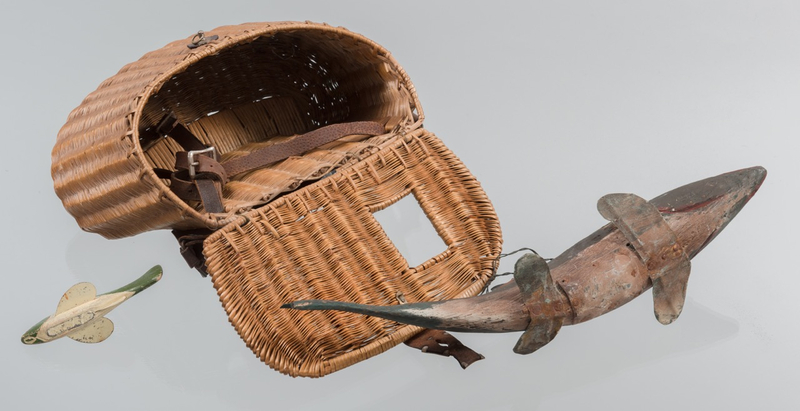 6" H x 12" L . 20th century. 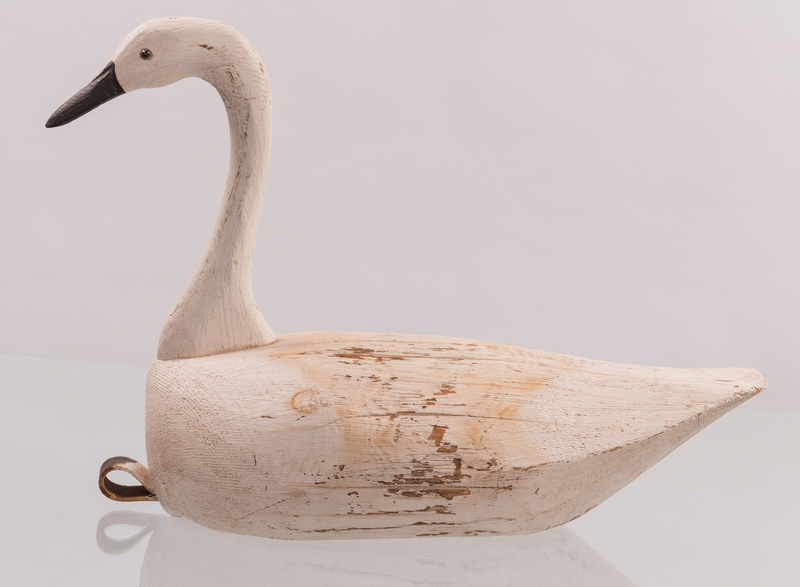 4th item: Carved and painted wood Canadian goose decoy with weight strip and rigged weight. 10 1/2" H x 19" L. 20th century. 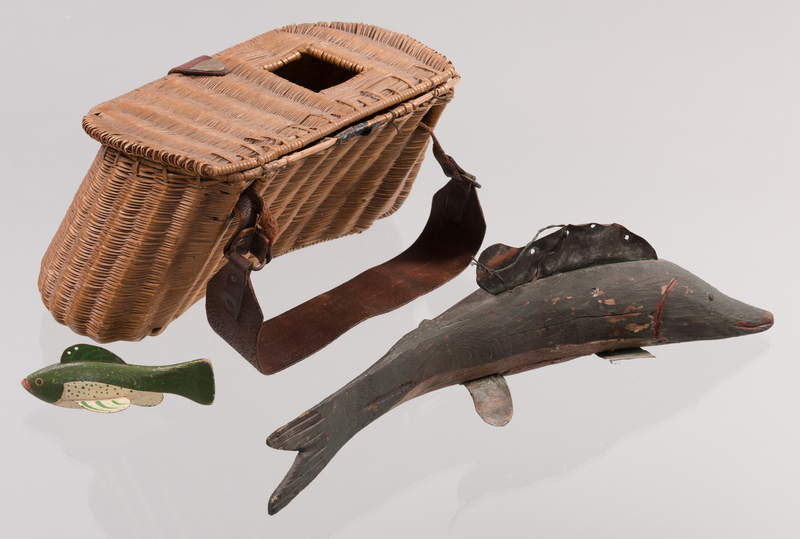 5th-6th items: Two carved and painted wood fish decoys, both weighted with metal fins. 4" H x 18" L and 2" H x 5" L. 20th century. 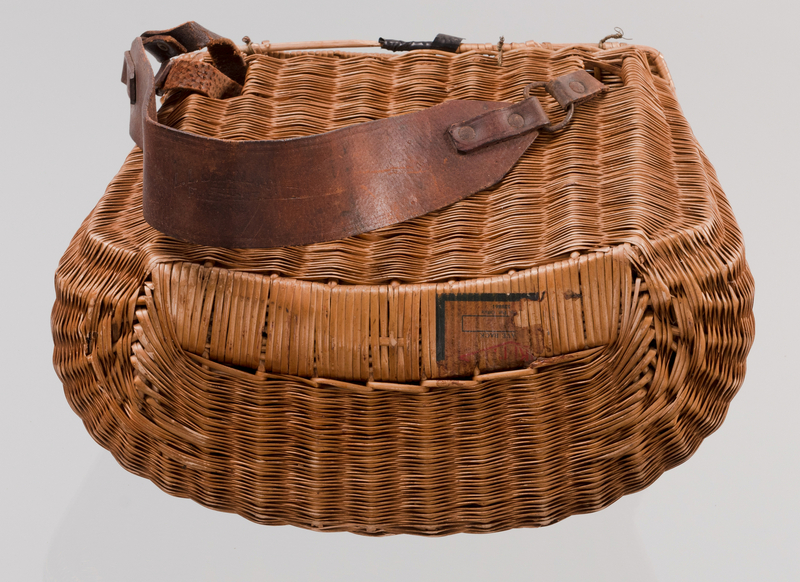 7th item: Split willow creel basket with tight French weave. Has a leather/metal fish motif closure for lid top. 12" L x 7" H. Total weight of lot, 24.3 pounds. Early 20th century. Estate of J.D. and Jane Vandercook, Hendersonville, TN. CONDITION: 1st item: Scattered wear to body and paint from use. 2nd item: Break to bill, scattered paint loss. 3rd item: Old repair to neck, some paint wear. 4th item: Head is loose at base and elongated neck with separation. 5th item: 7" crack running along top near fin, some rust. 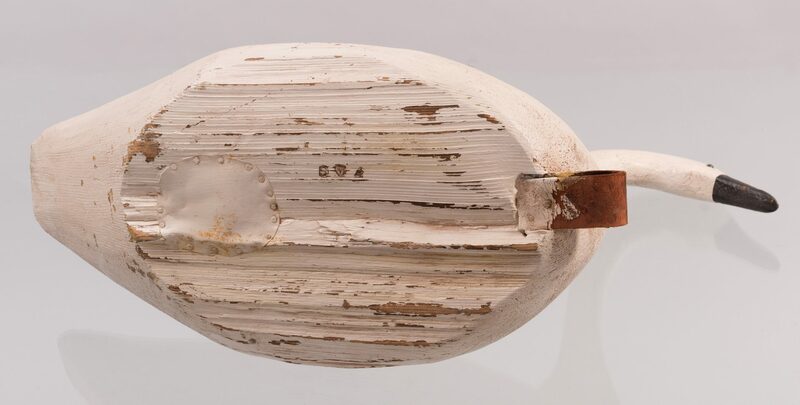 7th item: General wear to leather on creel, few breaks to wicker with one area taped, leather strap broken.